The Wish Original door stop collection includes the Candy Stripe Duckling Doorstop. 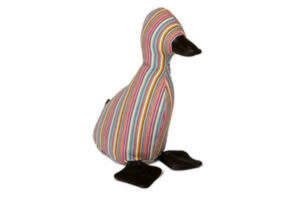 The shape and the colour of the duckling doorstop won’t be unnoticed by your guests! Fun and fabulous, this duckling doorstop with a leather beak and feet brings character to any room and make great home gifts. The Wish Original duckling doorstop is also available with the Union Jack pattern and both doorstops can be bought on ‘Gifts From Handpicked’. The duckling also waddled off with the Gift Of The Year 2010 Home accessories award.